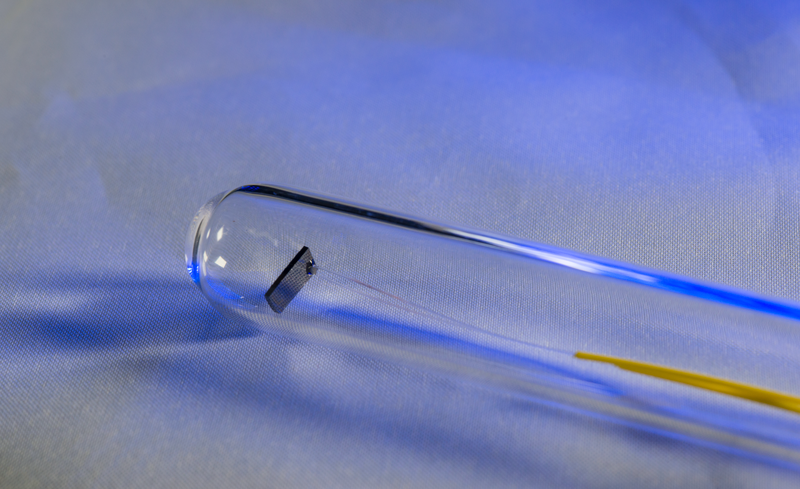 Close-up of a photonic thermometer prototype, revealing the top of the chip-based sensor. NIST has embarked on a sweeping program that will revolutionize measurement services and metrology by bringing them out of the lab and directly to the user. To that end, we are developing a suite of intrinsically accurate, quantum-based measurement technologies intended to be deployed nearly anywhere and anytime, performing uninterrupted without the need for NIST’s traditional measurement services. They will enable users to make precision measurements referenced to the International System of Units (SI) on factory floors, in hospital diagnostic centers, in commercial and military aircraft, in research labs, and ultimately in homes, automobiles, and personal electronic devices, among others. The program, called “NIST-on-a-Chip,” will meet those goals by creating prototypes for a new generation of ultra-compact, inexpensive, low-power measurement tools for quantities including time and frequency, distance, mass and force, temperature and pressure, electrical and magnetic fields, current and voltage, fluid volume and flow, and more. These NIST-pioneered technologies will be manufactured and distributed by the private sector, opening new tech-transfer and lab-to-market opportunities in accordance with NIST’s goal of strengthening U.S. economic competitiveness by supporting advanced manufacturing. The program is also designed to provide several other benefits. At present, many calibrations entail considerable down-time as users send valuable instruments or in-house standards to NIST periodically for testing against U.S. national standards, and then wait while the instruments are shipped back. NIST-on-a-Chip, by contrast, offers universal access to NIST-traceable, mass-produced, robust, and miniaturized (often to chip scale) instruments and standards that, in many cases, do not require external calibration because their operation relies on fundamental constants and invariant quantum phenomena. The components of most NIST-on-a-Chip devices can be produced with the same kind of silicon platforms and fabrication processes already employed in the manufacture of integrated-circuits and microelectromechanical systems (MEMS). That should result in devices that are both inexpensive and rugged, with dimensions that are easily incorporated into new or existing equipment. Eventually, a single chip-scale package will be able to perform measurements of multiple different quantities: For example, a time and frequency tool might also serve as a length scale, mounted next to a magnetic-field sensor that sits atop a quantum-based thermometer. That is possible thanks to recent NIST progress in understanding and control of a few core “building block” technologies. These include optical measurement of atomic transitions, high-precision interferometry, meticulous manipulation of exceedingly small cavities, lasers, and atomic gases, miniature frequency combs, and transfer of data over photonic circuits, among others. At present, the evolving program is planned to include robust projects across the NIST Laboratories in 12 technology areas. Click on each link below (we will be adding more links soon) for detailed information.